This shop is easy to visit by public transport, being located under the viaduct of Chelmsford railway station, which in turn is next to the bus station. It is an atmospheric location as the shop roof is constructed of corrugated iron within two arches. The trains pass directly overhead so the constant rumbles mix in with the music. Jonathan Smith was always going to open a record shop. When studying at Chelmsford College, he wrote a business plan on how to open one. A few years later, studying Business Management at Birmingham University, he wrote a thesis on “Why people buy vinyl off the internet”. Both projects turned out to have been instrumental in shaping his career. While at university, Jonathan started organising student nights that gave him the opportunity to test out his blossoming DJ skills. He moved into a house with four fellow DJs and there was great competition among them to be the first to get their hands on the latest vinyl releases. Jonathan had a brainwave. He decided to open accounts with record companies, informing them he was a mail order company. The problem was that record companies would only ship orders if they reached their minimum order level, which was normally around £50-£75. Jonathan therefore began ordering extra copies and selling them to his housemates and fellow students. Soon he had a genuine mail order operation as he was also supplying his mates back in Chelmsford. As part of his course in Business Management, Jonathan was required to set up a pretend business. But he was already doing it for real. Having based all his coursework on his experience of setting up the mail-order business, he duly graduated with flying colours. Jonathan bought the domain name www.intenserecords.co.uk and proceeded to build a website where customers could search and listen to all the tracks before ordering, and the records would be posted from his office, which was his bedroom. During the next break from university he returned to Chelmsford, where he discovered a new record shop had opened. It was not stocking much drum & bass, which was his forte, so he struck up a deal with the owner to supply the shop with all the latest drum & bass vinyl. Jonathan would collect any profits due when he returned during term breaks. This arrangement continued successfully until he graduated from university and needed a job. He persuaded the record shop owner to go into partnership with him, Jonathan would sell drum & bass while the owner concentrated on other genres of music. The shop was divided into two, with both having their own counters and walls to display their records. Unfortunately, they both had a set of decks resulting in “counter wars” as they both vied to play their own records. It soon became clear that Jonathan was attracting a greater share of the customers and that he had outgrown the shared premises. He thus resolved to find his own site where he could play drum & bass to his heart’s content. Jonathan opened his own shop in December 2003. On a memorable first day he played Santa, wrapping 50 packages of 12-inch singles in Christmas paper and giving them away to his first 50 customers. He held a launch party that was a huge triumph, with more than 500 people attending. It was so successful that after the “launch” party he had a “landed” party a couple of weeks later. The Essex Chronicle came down to interview him for a feature. It was arranged for early morning. Jonathan had been playing a club the previous evening, so the combination of excess drink and minimal sleep resulted in the paper printing a picture of a rather bleary and dishevelled record shop owner to accompany the piece. The next day when walking to work, he noticed the less-than-flattering picture on a lamp post. Soon he was to see dozens more as, unbeknown to him, his mates had printed off 50 posters and fly-posted them all over Chelmsford. For Jonathan, the best thing about owning Intense Records is that it was where he met his wife Jen. She had been a customer of the shop for more than three years, but always came in with a guy called Pete. Jonathan assumed that they were partners. One day Jen came in on her own and Jonathan enquired if she was still with Pete. Jen explained that Pete was just a mate she went shopping with for vinyl. The rest, as they say, is history. From 2002 things got tough as record retailing went into a steep decline. Jonathan did everything in his power to keep the business on an even keel. He was organising dance parties, running a website, working in the shop and even set up a separate company running coaches to house parties, although they were never hired to transport the local Women’s Institute for a day trip to Clacton. Jonathan also became a DJ on various pirate radio stations producing a two hour show each week featuring his own Top 10 dance chart. He would produce adverts for his shop on the radio and noticed that whatever background music he used on his adverts would immediately become the shop’s best seller over the following weeks. With business still slow, he decided to rent out half the shop to another business. Luckily, he found the perfect tenant. Jen, his wife, had started a merchandise printing company called Get Customised, and she moved her operation into the shop. In 2013 the shop’s fortunes revived. 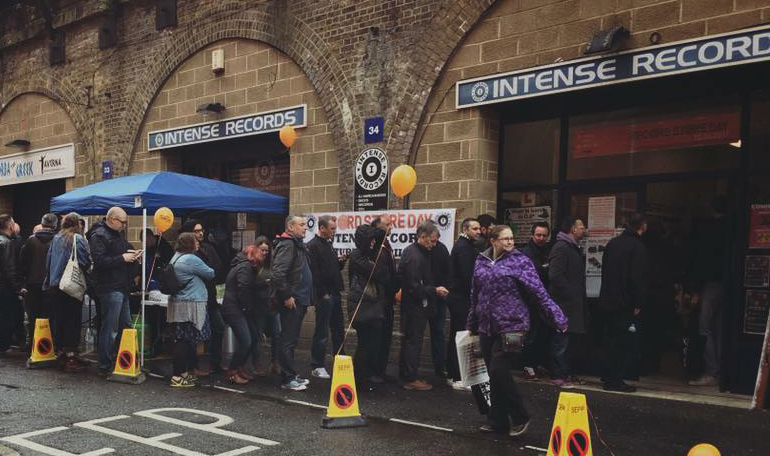 It was no coincidence that it was the first year that Intense Records took part in Record Store Day. As the shop was new to the party, Jonathan only dipped into the many releases available. He was apprehensive that the music fans of Chelmsford would not come to a drum & bass shop to buy rock and pop releases. The shop had its best sales day ever. Many people commented that they had never come in before because they thought it was only drum & bass. It was a turning point in the history of the shop. With the new-found customer base that they had gained, they changed direction and started selling all genres of music. By 2017, Jen’s business had outgrown the shop and she moved out to her own offices. Most people reading this have probably owned one of her products. In 2015 she was commissioned to print the official Record Store Day plastic carrier bags and other memorabilia supplied to participating shops. If you bought a record on RSD it is almost certain that you carried it home in one of these bags and many UK record shops have continued to use her services. Jen’s departure allowed the record shop to expand and Jonathan has since allocated one arch of the shop to dance music while the other arch sells a range of genres. 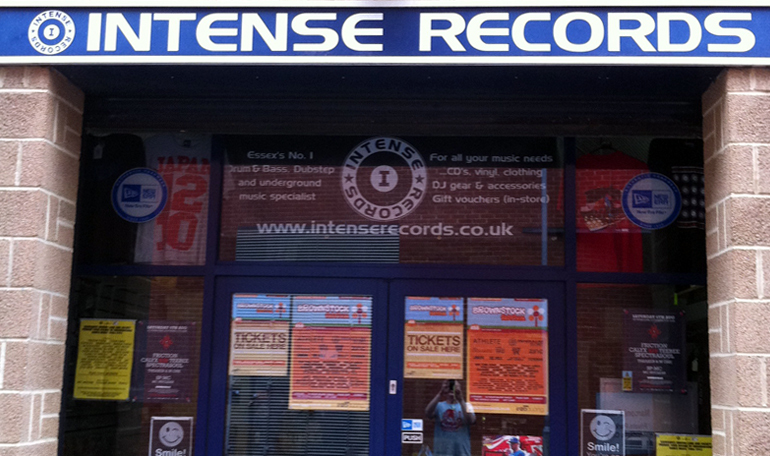 The best time to visit Intense is the first Saturday of the month. That is when Jonathan organises the Chelmsford Record Fair in The Ale House, a few doors down from the shop. Live bands and DJ’s play on the day and Jonathan organises his own burger and coffee stalls. Intense is an ideal name for the shop as it describes how Jonathan’s life has been for nearly 30 years. Jonathan and Jen are great examples of how independent record shops have had to diversify to survive. In this dynamic duo’s case they have diversified to thrive. Love the original of this and been playing it since it came out in 2007, we even booked him to come play for us at our local event. This new remix brings the tune back to life and with the original on the flip and on yellow vinyl, you cant go wrong. Set to be highest selling D&B track of the year for us !! Classic film, a favourite of mine and an equally as good soundtrack. Vinyl versions of this are super rare, so super excited to be getting a Limited 25th Anniversary Clear with White Splatter Vinyl Edition for the shop. Cant wait! If you would like to be Proper’s Featured Store, contact Graham Jones. 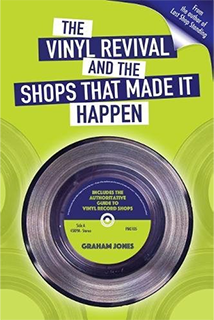 ‘Intense’ is one of over 200 independent record shops featured in the forthcoming book ‘The Vinyl Revival and the Shops That Made it Happen’ by Graham Jones released 21 September. Available to order at independent record shops, Propermusic.com and other online retailers. This entry was posted in Featured Store and tagged featured store, intense records.